Mumbai, Metro Rail News: The Consortium led by of Datamatics Global Services Limited (DGSL) and AEP Ticketing solutions S.R.L, Italy (AEP), have been issued the letter of acceptance (LOA) for implementing Automatic Fare Collection (AFC) system for 52 stations of Mumbai Metro Line 2A (Dahisar to DN Nagar Metro), 2B (DN Nagar to Mankhurd Metro) and 7 (Andheri (E) to Dahisar) of the Mumbai Metro Rail project. The LOA was issued by Mumbai Metropolitan Region Development Authority (MMRDA) to the Consortium for approximately Rs. 160 crores. 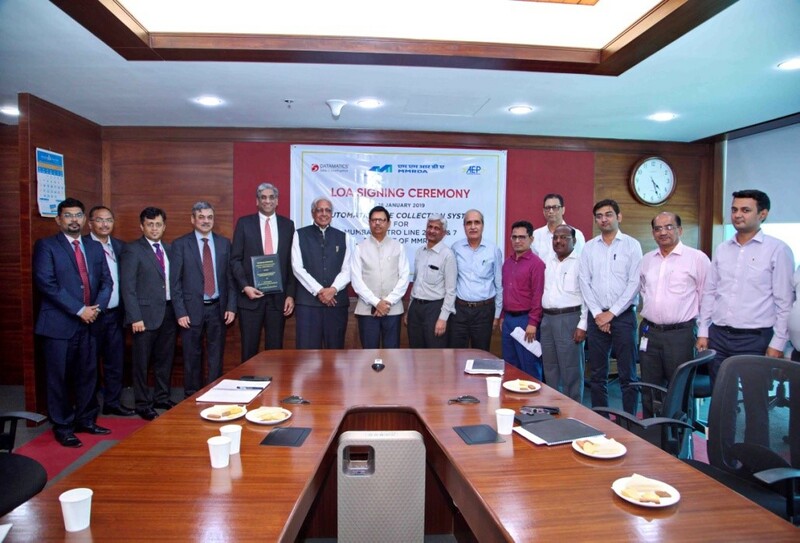 The LOA between the Consortium and MMRDA was signed in the presence of Shri. R. A. Rajeev, IAS, Metropolitan Commissioner, MMRDA; Shri. Sanjay Waghmare Director(Systems), Metro PIU, MMRDA, Mr. O.P.Nebhnani, Officer on Special Duty(S&T), Metro PIU MMRDA, Dr. Lalit Kanodia , Chairman , DGSL , Shri Rahul Kanodia, Vice Chairman & CEO – DGSL; Shri Sanjeev Subhedar, EVP and Global Head Engineering Services and other top officials from MMRDA and DGSL. Automated Fare Collection (AFC) has been a focus area for Datamatics and over the last 25 years, the company has been instrumental in successfully executing over 25 marquee projects in the tier 1 metropolitan cities across the globe including Sydney, Hong Kong, London, Chicago, Melbourne, etc. In India, Datamatics is also implementing AFC system for Lucknow Metro Project which includes design, supply, installation and end-to-end testing of the ticketing, gates, servers, hardware networks and software components. The first phase of this project has already gone live with 8 stations. This is the fastest rolled-out AFC system in India till date. Previous articleBudget provision for Regional Rapid Transit System (RRTS) by UP Govt.